Fischer, R., et al. A Pilot Study of Intense Pulsed Light Treatment for Keratosis Pilaris. (2015) Cell Immunol Serum Biol 1(1): 17- 19. Background & Objective: Keratosis pilaris (KP) is a common benign skin disorder characterized by small folliculocentric keratotic papules. Patients with KP are generally asymptomatic but often seek treatment for cosmetic purposes. Current treatments for KP have failed to achieve consistently successful results. The use of intense pulsed light therapy(IPL), a non-ablative laser treatment, has proven effective for diminishing erythema and inflammation in chronic conditions such as rosacea but has not been studied for the treatment of KP. We hypothesized that consistent treatment over several months with the Cutera Xeo IPL intense pulsed light treatment (560-1200 nm) would result in significant clinical improvement of KP. Materials and methods: Twelve subjects with moderate to severe KP of the bilateral arms were enrolled in a single group experimental research study. Three sessions of IPL therapy over a 12-week period were used to treat an upper arm of each patient. The patient’s contra lateral arm served as a control and was treated with a bland emollient only. The time course included 0, 4, 8, and 12 weeks to assess treatment efficacy. The Keratosis Pilaris Severity Index (KPSI) and Dermatology Life Quality Index (DLQI) were tabulated at each visit, and photographs were taken before and after each treatment. A linear mixed model was used to estimate the time course of response. Results: A significant reduction in KPSI from baseline was observed. Limitations: This single group experimental research pilot study had a small sample size, no concurrent untreated control group, several patients lost to follow-up, and power that did not allow for secondary data analysis. Conclusion: IPL can be used as a safe, effective treatment option for KP that has failed more conventional therapeutic options. Keratosis pilaris (KP) is a common benign genetic skin disorder of unknown etiology characterized by small, rough folliculocentric keratotic papules typically involving the upper arms, anterior thighs, face, and buttocks. Keratosis Pilaris is often described in association with other dry skin conditions such as ichthyosis vulgaris, xerosis, and atopic dermatitis. Although KP is generally asymptomatic, many patients find the condition to be cosmetically disfiguring and psychologically distressing, prompting them to seek treatment. No single cure or universally effective treatment is currently available for KP. Several of the current treatments for keratosis pilaris, including bland emollients, keratolytics, vitamin D3 analogs, and topical and systemic retinoids, have failed to achieve consistently successful results. More recently various laser modalities have been utilized as effective treatments for KP. However, the use of IPL therapy, a non-ablative laser treatment that has been proven effective for diminishing erythema and inflammation in chronic conditions such as rosacea, has not yet been studied for the treatment of keratosis pilaris. We hypothesized that consistent treatment over several months with the Cutera Xeo IPL intense pulsed light treatment (560-1200 nm) would result in significant clinical improvement of KP and serve as a safe and innovative way to augment the current management and treatment options for keratosis pilaris. The Keratosis Pilaris Severity Index (KPSI), a tool used to measure the keratosis pilaris severity and degree of body surface area involvement, was tabulated for all subjects at the initial visit to achieve a baseline score. 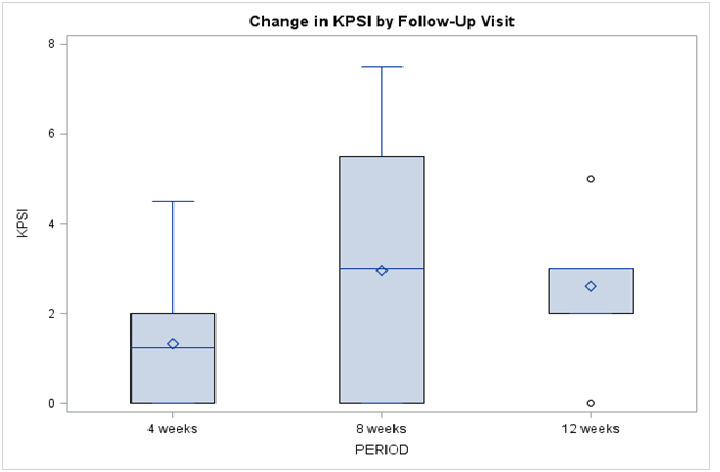 Twelve patients (8 female and 4 male) with a baseline classification of at least “moderate severity” on the KPSI were enrolled in a single group experimental research study to assess IPL therapy as treatment for KP (Figure 1). The treatment regimen consisted of 3 sessions of IPL therapy over the course of 12 weeks to be performed at routine office visits in the dermatology clinic. The time course for treatment included 0 weeks as the baseline and 1st treatment, 4 weeks as the 2nd treatment, 8 weeks as the 3rd treatment, and 12 weeks as the final visit to assess overall improvement and obtain follow up photographs (Figure 2). The IPL treatment was localized to one upper extremity affected with KP. The control included daily moisturizing treatment with a bland emollient to the contralateral untreated extremity. At each visit the Keratosis Pilaris Severity Index (KPSI) score was tabulated for each subject, and all patients completed the Dermatology Life Quality Index (DLQI). Photographs were taken of both the control area and the treatment area prior to initial treatment and following each subsequent treatment. Finally, the patient was assessed for adverse effects from the IPL treatment at each clinic visit. A random effects linear model was used to assess whether a statistically significant variation in subjects’ responses over time exists. Treating time as a random effect (as opposed to a fixed effect) allows us to account for the inherent dependence among repeated observations on a subject while including all observed responses the analysis, thereby circumventing any missing data and timing of observation issues that would have been raised by treating time as a fixed effect. Summary statistics are reported for each observation period. To further elucidate the pattern of change over time, pair-wise comparisons of each follow-up period with baseline are provided within the structure of the random effects model. A significant improvement in subject response over time as measured by KPSI was identified (p = 0.024, Table 1). 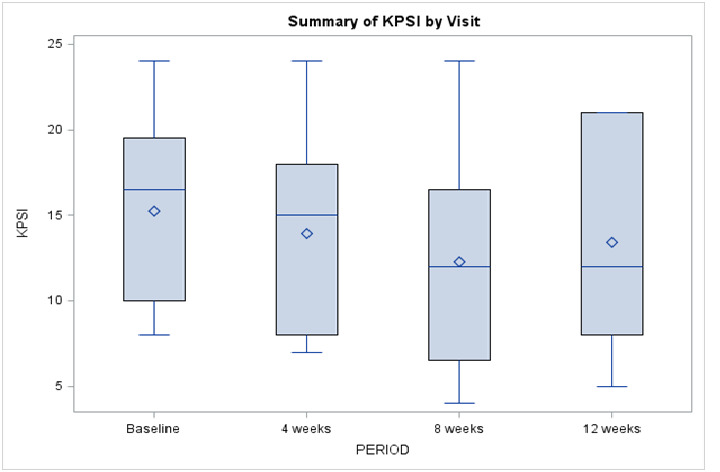 Following the first treatment, KPSI decreased, on average by 1.33 points (p 0.023). For the five subjects for which a third follow-up was recorded, KPSI decreased on average by 2.6 points (p = 0.037). † Change in response compared to baseline based on Z test of within-subject (time) variance component within the framework of the random effects model. Intense pulsed light (IPL) therapy has been established as a successful medical treatment for vascular lesions, hypertrichosis, and irregular pigmentation. Intense pulsed light systems are high intensity pulsed sources that work with noncoherent light in a broad wavelength spectrum of 515-1200 nm to emit polychromatic light. This broad wavelength spectrum allows for selection of absorption maximums for various target structures, resulting in a fine-tuned mechanism of heating and destruction. The wavelength chosen by each structure specifies the absorption behavior and penetration depth of the light. Intense pulsed light systems also tailor the wavelength to individual skin type, which helps to prevent dermatologic side effects. Transient erythema, which can last for 2-48 hours, is the most commonly cited adverse effect of IPL treatment. Patients may feel sensations of burning and stinging during treatment, which increase with higher intensity and shorter pulses. Additional side effects vary by patient and depend on the skin tone, thickness of dermis, and density of sebaceous glands in the treatment area. Atrophic scarring, blistering, and permanent hypopigmentation rarely occur with IPL treatment. Two patients in our study experienced transient stinging and minor erythema during the acute treatment that resolved with completion of IPL therapy. One female patient experienced significant burning, erythema, and desquamation in the days following treatment. This was resolved with ice application, topical Biafine® cream, and a decrease in IPL intensity during subsequent treatments. There has been one published study evaluating the efficacy of IPL therapy for keratosis pilaris atrophicans (KPA). Keratosis pilaris atrophicans is a less frequent variant of KP that is often refractory to treatment and associated with significant scarring. This study noted a 75-100% reduction of erythema in regions treated with IPL with no reported adverse effects. Keratosis pilaris rubra and keratosis pilaris atrophicans have also been reported to respond to treatment with a 595 nm pulsed dye laser (PDL)[1,4]. Improvement was generally noticed after the initial treatment session, with erythema and post-therapy scaling being the only major side effects. A pilot study using the Q-switched 1064 nm Nd:YAG laser for treatment of KP reported greater than 25% improvement in texture and dyspigmentation in eleven of twelve patients. Histopathologic analysis revealed normalization of the epidermis with disappearance of follicular plugging. The only adverse effects noted were tingling sensation during laser treatment and transient erythema after treatment. Keratosis pilaris is a benign disorder characterized by varying degrees of follicular hyperkeratosis and perifollicular erythema. Common complaints include pruritus, rough-textured skin, and cosmetic appearance. Traditional treatments have included keratolytics and topical retinoids, but these preparations often aggravate the erythema and are limited in effectiveness. New treatment modalities for cosmetic dermatologic conditions have turned toward laser therapy. Pulsed dye laser has been used for KPA. The Q-switched laser has recently been reported as a successful treatment for KP. To date, and to the best of our knowledge, there have been no published reports of IPL therapy for KP. Our study results suggest that IPL may be a promising new therapeutic option for keratosis pilaris, especially in cases where more traditional treatment options have been exhausted. Advantages to IPL therapy for KP include timely clinical improvement, few adverse effects, and removing the necessity for daily topical therapy. Disadvantages include cost and multiple treatment appointments. Although many cases of keratosis pilaris may not need this type of therapeutic intervention, IPL provides another viable option in the dermatologist’s treatment arsenal for KP. 1. Lee, S.J., Chung, W.S., Kim, J., et al. Combination of 595-nm pulsed dye laser, long-pulsed 755-nm alexandrite laser and microdermabrasion treatment for keratosis pilaris. (2012) J Dermatol 39(5): 479-480. 2. Raulin, C., Greve, B., Grema, H. IPL technology: a review. (2003) Lasers Surg Med 32(2): 78-87. 3. Rodriguez-Lojo, R., Pozo, J.D., Barja, J.M., et al. Keratosis pilaris atrophicans: treatment with intense pulsed light in four patients. (2010) J Cosmet Laser Ther 12(4): 188-190. 4. Marqueling, A.L., Gillaim, A.E., Prendiville, J., et al. Keratosis pilaris rubra. a common but underrecognized condition. (2006) Arch Dermatol 142(12): 1611-1616. 5. Park, J., Kim, B.J., Kim, M.N., et al. A pilot study of q-switched 1064-nm Nd:YAG laser treatment in the keratosis pilaris. (2011) Ann Dermatol 23(3): 293-298.